Download "No Professional Care Required. No Waiting Period. No Professional Care Required. No Waiting Period"
2 LIFE INSURANCE WITH BENEFITACCESS RIDER: A COMPETITIVE LIFE INSURANCE WITH BENEFITACCESS VS. 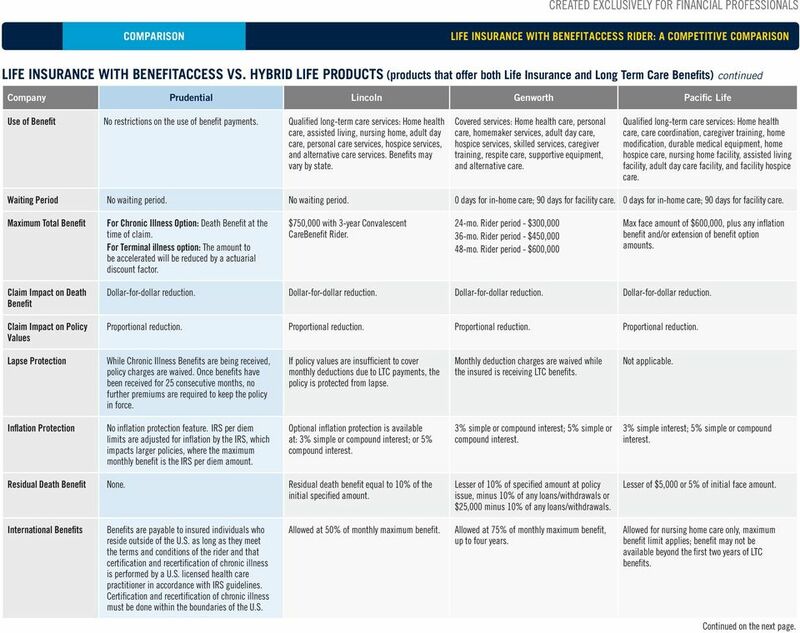 HYBRID LIFE PRODUCTS (products that offer both Life Insurance and Long Term Care s) The information below was obtained from each company s respective rider contract, as of October 1, Although we believe it to be accurate as of the time of this printing, we cannot guarantee the accuracy. Keep in mind that the Access Rider is not long-term care and is not intended to replace the need for longterm care (LTC) insurance and that the rider s benefits may not cover all of the costs associated with a chronic illness. Company Prudential Lincoln Genworth Pacific Life Product Prudential life insurance with Access Rider MoneyGuard Reserve Plus Total Living Coverage PremierCare Policy Structure Flexible premium universal life (UL) product, with an optional accelerated death benefit rider for chronic or terminal illness. Flexible premium UL product which provides a death benefit and long-term care benefits. 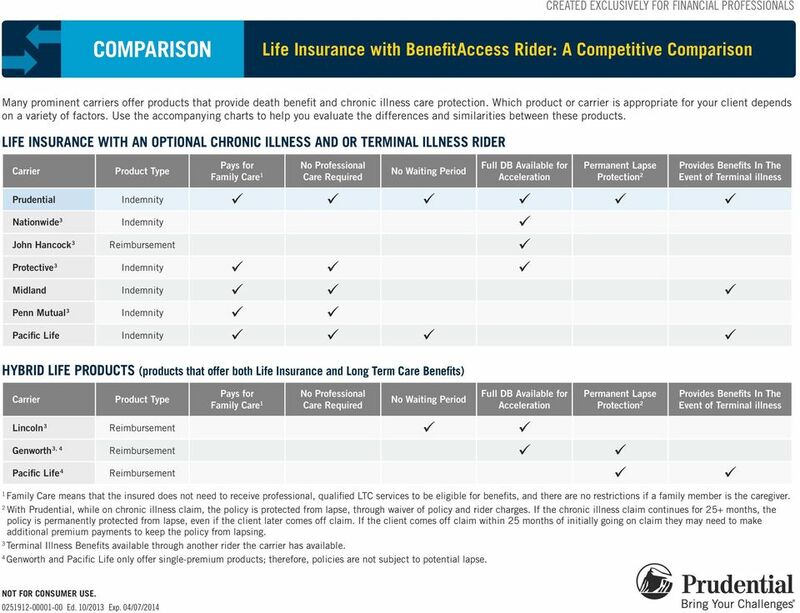 Flexible premium UL product which includes a rider that accelerates the policy s death benefit if the insured becomes chronically ill. Flexible premium UL product which provides a death benefit and long-term care benefits. Premium Options Flexible premium. Single, 3-, 5-, 7-, or 10-year period. Single premium. Additional premiums allowed. Single premium secures guaranteed death proceeds, Return of Premium benefit, and total LTC benefits. Additional premiums allowed. Issue Ages Living Type Accelerated death benefit Long-term care benefit Long-term care benefit Long-term care benefit Tax Qualified Status 101(g) 7702b 7702b 7702b Qualification for s Certification of chronic illness by a licensed health care practitioner that the insured is chronically ill (as defined in the rider) and under a plan of care that describes services that are likely to be needed for the rest of the insured s life. Recertified annually. Certification of terminal illness by a licensed health care practitioner that the insured s life expectancy is 6 months or less. Certification that the insured is chronically ill and under a plan of care that involves one of the covered services described in the contract. Insured must be receiving services. Recertification required annually. Certification that the insured is chronically ill and under a plan of care that involves one of the covered services described in the contract. Insured must be receiving services. Recertification required annually. 1. Insured must be certified as chronically ill by a licensed health care practitioner (LHCP); 2. LHCP must approve a plan of care for covered long-term care services that the insured receives while the policy is in force. 3. Recertified annually. Payment Chronic Illness: Monthly indemnity, annual lump sum, or one-time lump sum. Terminal Illness: 1-time partial or lump sum. Monthly reimbursement. Monthly reimbursement. Monthly reimbursement. 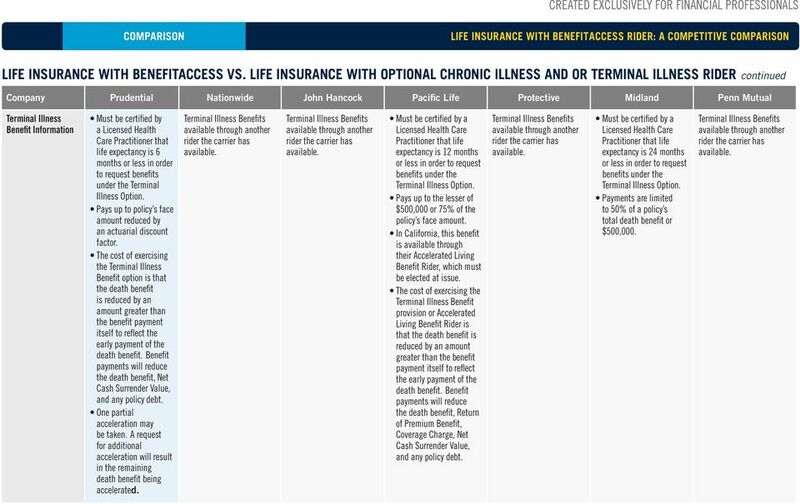 Maximum Monthly For Chronic Illness Option Maximum monthly benefit is 2% of the death benefit at time of claim, not to exceed: The monthly equivalent of the IRS per diem limit at the time of claim; or the monthly equivalent of the IRS per diem limit on the policy issue date, compounded annually at 4%. Full reimbursement for qualified, covered services. Specified amount divided by the accelerated benefit rider period (elected by the insured either 24 months or 48 months with extension of benefits rider) capped at $25,000 per month. The cost of covered long-term care expenses actually incurred. 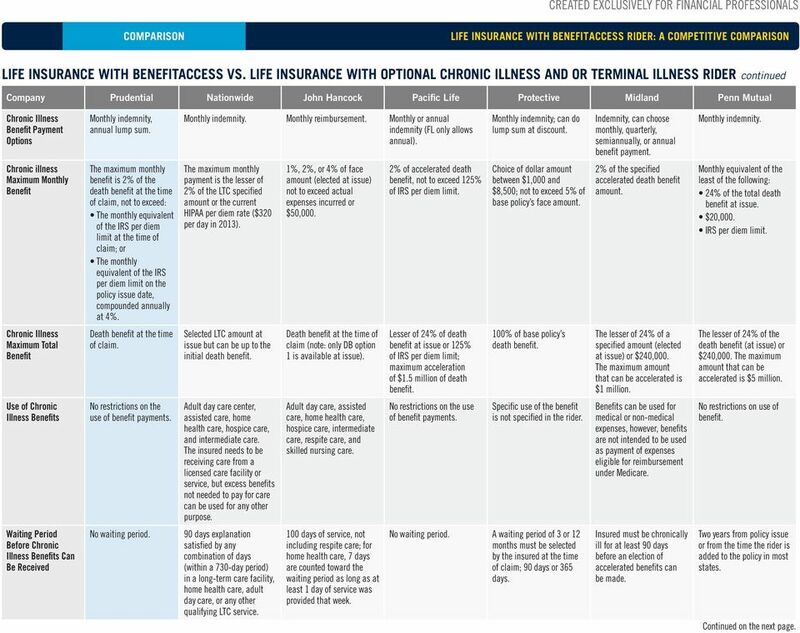 3 LIFE INSURANCE WITH BENEFITACCESS RIDER: A COMPETITIVE LIFE INSURANCE WITH BENEFITACCESS VS. 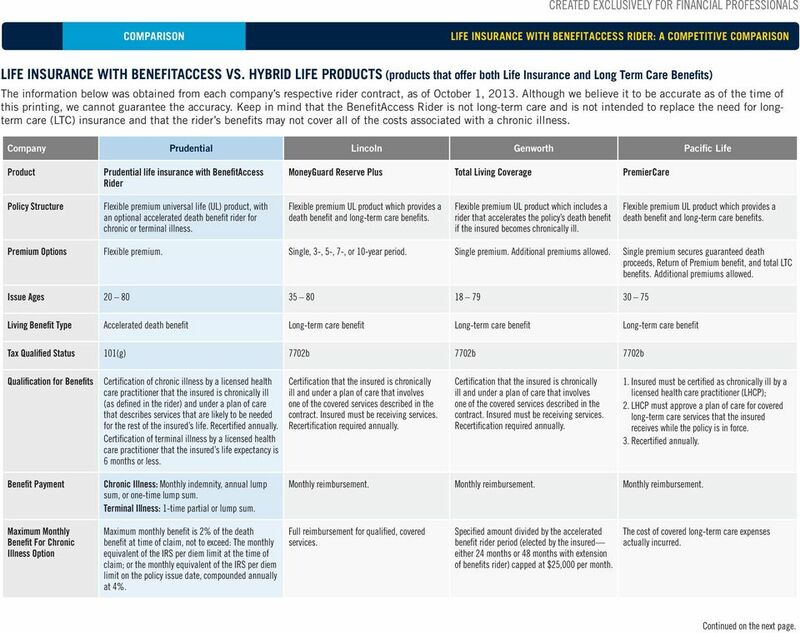 HYBRID LIFE PRODUCTS (products that offer both Life Insurance and Long Term Care s) continued Company Prudential Lincoln Genworth Pacific Life Use of No restrictions on the use of benefit payments. Qualified long-term care services: Home health care, assisted living, nursing home, adult day care, personal care services, hospice services, and alternative care services. s may vary by state. Covered services: Home health care, personal care, homemaker services, adult day care, hospice services, skilled services, caregiver training, respite care, supportive equipment, and alternative care. Qualified long-term care services: Home health care, care coordination, caregiver training, home modification, durable medical equipment, home hospice care, nursing home facility, assisted living facility, adult day care facility, and facility hospice care. Waiting Period No waiting period. No waiting period. 0 days for in-home care; 90 days for facility care. 0 days for in-home care; 90 days for facility care. Maximum Total For Chronic Illness Option: Death at the time of claim. For Terminal illness option: The amount to be accelerated will be reduced by a actuarial discount factor. $750,000 with 3-year Convalescent Care Rider. 24-mo. Rider period - $300, mo. Rider period - $450, mo. Rider period - $600,000 Max face amount of $600,000, plus any inflation benefit and/or extension of benefit option amounts. Claim Impact on Death Claim Impact on Policy Values Dollar-for-dollar reduction. Dollar-for-dollar reduction. Dollar-for-dollar reduction. Dollar-for-dollar reduction. Proportional reduction. Proportional reduction. Proportional reduction. Proportional reduction. Lapse Protection While Chronic Illness s are being received, policy charges are waived. Once benefits have been received for 25 consecutive months, no further premiums are required to keep the policy in force. If policy values are insufficient to cover monthly deductions due to LTC payments, the policy is protected from lapse. Monthly deduction charges are waived while the insured is receiving LTC benefits. Not applicable. Inflation Protection No inflation protection feature. IRS per diem limits are adjusted for inflation by the IRS, which impacts larger policies, where the maximum monthly benefit is the IRS per diem amount. Optional inflation protection is available at: 3% simple or compound interest; or 5% compound interest. 3% simple or compound interest; 5% simple or compound interest. 3% simple interest; 5% simple or compound interest. Residual Death None. Residual death benefit equal to 10% of the initial specified amount. Lesser of 10% of specified amount at policy issue, minus 10% of any loans/withdrawals or $25,000 minus 10% of any loans/withdrawals. Lesser of $5,000 or 5% of initial face amount. International s s are payable to insured individuals who reside outside of the U.S. as long as they meet the terms and conditions of the rider and that certification and recertification of chronic illness is performed by a U.S. licensed health care practitioner in accordance with IRS guidelines. Certification and recertification of chronic illness must be done within the boundaries of the U.S. Allowed at 50% of monthly maximum benefit. Allowed at 75% of monthly maximum benefit, up to four years. Allowed for nursing home care only, maximum benefit limit applies; benefit may not be available beyond the first two years of LTC benefits. 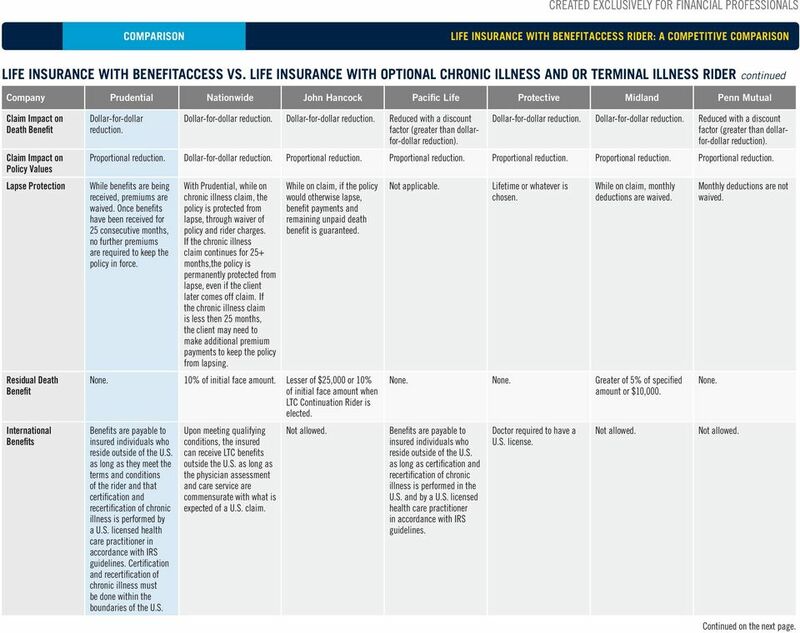 4 LIFE INSURANCE WITH BENEFITACCESS RIDER: A COMPETITIVE LIFE INSURANCE WITH BENEFITACCESS VS. 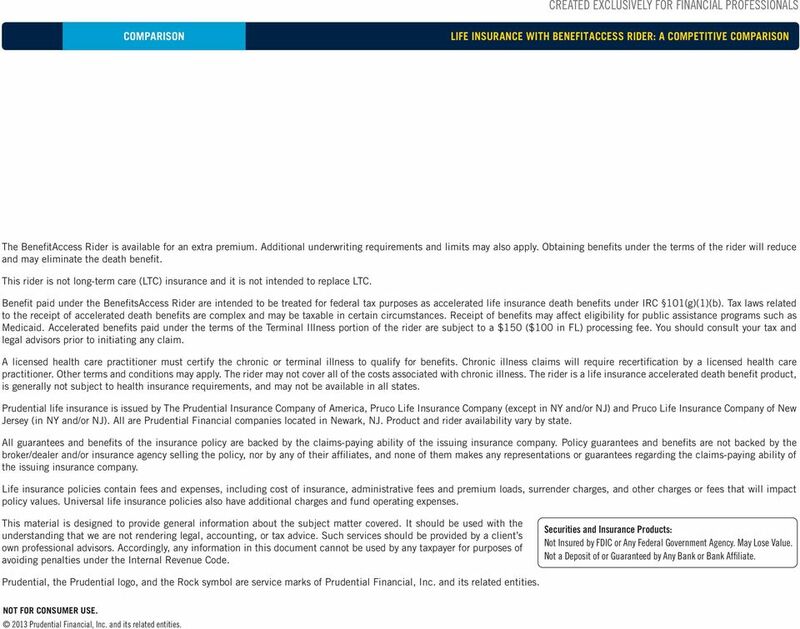 HYBRID LIFE PRODUCTS (products that offer both Life Insurance and Long Term Care s) continued Company Prudential Lincoln Genworth Pacific Life Return of Premium Feature None. Lifetime. 15 years. Lifetime. Terminal Illness Information Must be certified by a Licensed Health Care Practitioner that life expectancy is 6 months or less in order to request benefits under the Terminal Illness Option. Pays up to policy s face amount reduced by an actuarial discount factor. The cost of exercising the Terminal Illness option is that the death benefit is reduced by an amount greater than the benefit payment itself to reflect the early payment of the death benefit. payments will reduce the death benefit, Net Cash Surrender Value, and any policy debt. One partial acceleration may be taken. A request for additional acceleration will result in the remaining death benefit being accelerated. Terminal Illness s available through another rider the carrier offers. Terminal Illness s available through another rider the carrier offers. Must be certified by a Licensed Health Care Practitioner that life expectancy is 12 months or less in order to request benefits under the Terminal Illness Option. Pays up to the lesser of $500,000 or 75% of the policy s face amount. In California, this benefit is available through their Accelerated Living Rider, which must be elected at issue. The cost of exercising the Terminal Illness provision or Accelerated Living Rider is that the death benefit is reduced by an amount greater than the benefit payment itself to reflect the early payment of the death benefit. payments will reduce the death benefit, Return of Premium, Coverage Charge, Net Cash Surrender Value, and any policy debt. 5 LIFE INSURANCE WITH BENEFITACCESS RIDER: A COMPETITIVE LIFE INSURANCE WITH BENEFITACCESS VS. LIFE INSURANCE WITH OPTIONAL CHRONIC ILLNESS AND OR TERMINAL ILLNESS RIDER Company Prudential Nationwide John Hancock Pacific Life Protective Midland Penn Mutual Rider Name Access Rider Long-Term Care Rider Long-Term Care Continuation Rider Premier Living s ExtendCare Rider Accelerated Rider Chronic Illness Accelerated Death Rider Chronic Illness Product Availability Single Life UL. GUL, CAUL, IUL, VUL. GUL, CAUL, IUL, VUL. VUL, IUL, UL, GUL. GUL. GUL, CAUL, IUL, VUL. All permanent life insurance policies. Rider Charge Monthly deductions. Monthly deductions. Treated as distributions and reduce cost basis. Monthly deductions. Treated as distributions and reduce cost basis. No charge, however, accelerated benefit payments reduce the death benefit using an interest component plus mortality element, resulting in a death benefit reduction which is greater than a dollar-for-dollar reduction. Reduction in death benefit varies based on age and policy performance. Monthly deductions. No charge, however, accelerated benefit amount received is reduced by a discount factor (death benefit is reduced dollarfor-dollar). No charge, however, accelerated benefit payments reduce the death benefit using an interest component plus mortality element, resulting in a death benefit reduction which is greater than a dollar-for-dollar reduction. Reduction in death benefit varies based on age of the insured (death benefit reduction is greater for a younger person than for an older person). Premium Options Flexible premium. Flexible premium. Flexible premium. Flexible premium. Flexible premium. Flexible premium. Flexible premium. Issue Ages (18 75 PIP LT and PIA 4) Living Type Accelerated Death Not available for issue ages over or older Long-Term Care Long-Term Care Accelerated Death Accelerated Death Accelerated Death Accelerated Death Tax Qualified Status 101(g) 7702b 7702b 101(g) 101(g) 101(g) 101(g) Qualification for s Certification of chronic illness by a licensed health care practitioner that the insured is chronically ill (as defined in the rider) or has a severe cognitive impairment. Recertified annually. Does not require submission of receipts; does not require expenses to be incurred. Certification by a physician that the insured is chronically ill. Confinement of the insured in a longterm care facility or confinement at home and receiving home health care from a hospital with a valid operating certificate or by a home health service or agency with a valid certificate. Certification by a physician that the insured is unable to perform at least two ADLs for a period expected to last at least 90 days. The insured receives qualified LTC services covered under the rider. Written proof of loss for the insured must be presented. Recertified at least annually. Certification of chronic illness by a licensed health care practitioner that the insured is chronically ill (as defined in the rider) and under a plan of care that describes services that are likely to be needed for the rest of the insured s life. Recertified annually. Does not require submission of receipts; does not require expenses to be incurred. Written certification from a licensed health care practitioner that the insured is chronically ill, and in need of services that are likely to be needed for the rest of the insured s life, as set forth in a plan of care. Recertified annually. Certification by a licensed health care practitioner that the insured: 1) Is permanently unable to perform at least two of six ADLs; or 2) Requires substantial supervision by another person to protect him- or herself from threats to health and safety due to severe cognitive impairment. Recertified annually. Certification by a licensed health care practitioner that the insured has a chronic illness (failure to perform at least two of six ADLs for at least 90 days or cognitive impairment). Recertified annually (if periodic payments elected). Insured is age 20 or older. Rider is attached to policy for at least two years. 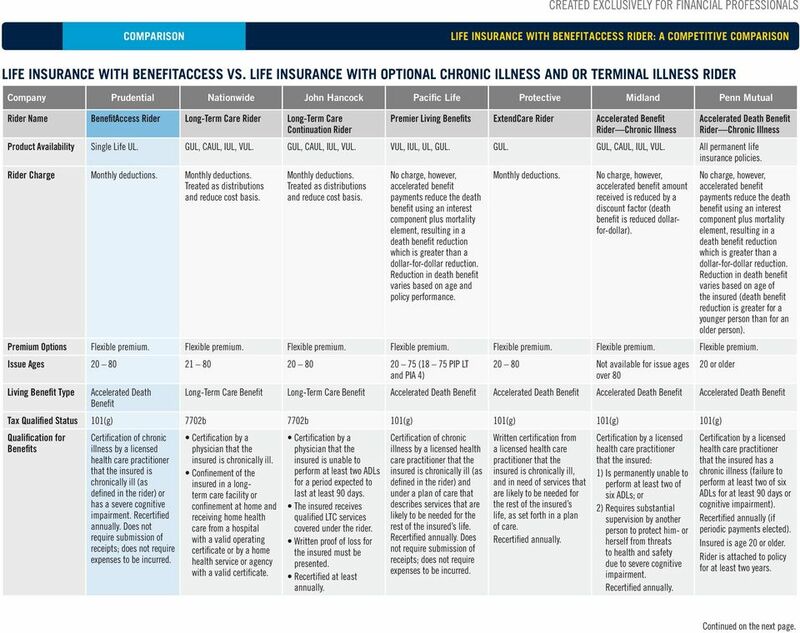 6 LIFE INSURANCE WITH BENEFITACCESS RIDER: A COMPETITIVE LIFE INSURANCE WITH BENEFITACCESS VS. LIFE INSURANCE WITH OPTIONAL CHRONIC ILLNESS AND OR TERMINAL ILLNESS RIDER continued Company Prudential Nationwide John Hancock Pacific Life Protective Midland Penn Mutual Chronic Illness Payment Options Monthly indemnity, annual lump sum. Monthly indemnity. Monthly reimbursement. Monthly or annual indemnity (FL only allows annual). Monthly indemnity; can do lump sum at discount. Indemnity, can choose monthly, quarterly, semiannually, or annual benefit payment. Monthly indemnity. Chronic illness Maximum Monthly The maximum monthly benefit is 2% of the death benefit at the time of claim, not to exceed: The monthly equivalent of the IRS per diem limit at the time of claim; or The monthly equivalent of the IRS per diem limit on the policy issue date, compounded annually at 4%. The maximum monthly payment is the lesser of 2% of the LTC specified amount or the current HIPAA per diem rate ($320 per day in 2013). 1%, 2%, or 4% of face amount (elected at issue) not to exceed actual expenses incurred or $50,000. 2% of accelerated death benefit, not to exceed 125% of IRS per diem limit. Choice of dollar amount between $1,000 and $8,500; not to exceed 5% of base policy s face amount. 2% of the specified accelerated death benefit amount. Monthly equivalent of the least of the following: 24% of the total death benefit at issue. $20,000. IRS per diem limit. Chronic Illness Maximum Total Death benefit at the time of claim. Selected LTC amount at issue but can be up to the initial death benefit. Death benefit at the time of claim (note: only DB option 1 is available at issue). Lesser of 24% of death benefit at issue or 125% of IRS per diem limit; maximum acceleration of $1.5 million of death benefit. 100% of base policy s death benefit. The lesser of 24% of a specified amount (elected at issue) or $240,000. The maximum amount that can be accelerated is $1 million. The lesser of 24% of the death benefit (at issue) or $240,000. The maximum amount that can be accelerated is $5 million. Use of Chronic Illness s No restrictions on the use of benefit payments. Adult day care center, assisted care, home health care, hospice care, and intermediate care. The insured needs to be receiving care from a licensed care facility or service, but excess benefits not needed to pay for care can be used for any other purpose. Adult day care, assisted care, home health care, hospice care, intermediate care, respite care, and skilled nursing care. No restrictions on the use of benefit payments. Specific use of the benefit is not specified in the rider. s can be used for medical or non-medical expenses, however, benefits are not intended to be used as payment of expenses eligible for reimbursement under Medicare. No restrictions on use of benefit. Waiting Period Before Chronic Illness s Can Be Received No waiting period. 90 days explanation satisfied by any combination of days (within a 730-day period) in a long-term care facility, home health care, adult day care, or any other qualifying LTC service. 100 days of service, not including respite care; for home health care, 7 days are counted toward the waiting period as long as at least 1 day of service was provided that week. No waiting period. A waiting period of 3 or 12 months must be selected by the insured at the time of claim; 90 days or 365 days. Insured must be chronically ill for at least 90 days before an election of accelerated benefits can be made. Two years from policy issue or from the time the rider is added to the policy in most states. 7 LIFE INSURANCE WITH BENEFITACCESS RIDER: A COMPETITIVE LIFE INSURANCE WITH BENEFITACCESS VS. LIFE INSURANCE WITH OPTIONAL CHRONIC ILLNESS AND OR TERMINAL ILLNESS RIDER continued Company Prudential Nationwide John Hancock Pacific Life Protective Midland Penn Mutual Claim Impact on Death Claim Impact on Policy Values Lapse Protection Residual Death International s Dollar-for-dollar reduction. Dollar-for-dollar reduction. Dollar-for-dollar reduction. Reduced with a discount factor (greater than dollarfor-dollar reduction). Dollar-for-dollar reduction. Dollar-for-dollar reduction. Reduced with a discount factor (greater than dollarfor-dollar reduction). Proportional reduction. Dollar-for-dollar reduction. Proportional reduction. Proportional reduction. Proportional reduction. Proportional reduction. Proportional reduction. While benefits are being received, premiums are waived. Once benefits have been received for 25 consecutive months, no further premiums are required to keep the policy in force. With Prudential, while on chronic illness claim, the policy is protected from lapse, through waiver of policy and rider charges. If the chronic illness claim continues for 25+ months,the policy is permanently protected from lapse, even if the client later comes off claim. If the chronic illness claim is less then 25 months, the client may need to make additional premium payments to keep the policy from lapsing. While on claim, if the policy would otherwise lapse, benefit payments and remaining unpaid death benefit is guaranteed. None. 10% of initial face amount. Lesser of $25,000 or 10% of initial face amount when LTC Continuation Rider is elected. s are payable to insured individuals who reside outside of the U.S. as long as they meet the terms and conditions of the rider and that certification and recertification of chronic illness is performed by a U.S. licensed health care practitioner in accordance with IRS guidelines. Certification and recertification of chronic illness must be done within the boundaries of the U.S. Upon meeting qualifying conditions, the insured can receive LTC benefits outside the U.S. as long as the physician assessment and care service are commensurate with what is expected of a U.S. claim. Not allowed. Not applicable. Lifetime or whatever is chosen. While on claim, monthly deductions are waived. None. None. Greater of 5% of specified amount or $10,000. s are payable to insured individuals who reside outside of the U.S. as long as certification and recertification of chronic illness is performed in the U.S. and by a U.S. licensed health care practitioner in accordance with IRS guidelines. Doctor required to have a U.S. license. Not allowed. Monthly deductions are not waived. None. Not allowed. 8 LIFE INSURANCE WITH BENEFITACCESS RIDER: A COMPETITIVE LIFE INSURANCE WITH BENEFITACCESS VS. LIFE INSURANCE WITH OPTIONAL CHRONIC ILLNESS AND OR TERMINAL ILLNESS RIDER continued Company Prudential Nationwide John Hancock Pacific Life Protective Midland Penn Mutual Terminal Illness Information Must be certified by a Licensed Health Care Practitioner that life expectancy is 6 months or less in order to request benefits under the Terminal Illness Option. Pays up to policy s face amount reduced by an actuarial discount factor. The cost of exercising the Terminal Illness option is that the death benefit is reduced by an amount greater than the benefit payment itself to reflect the early payment of the death benefit. payments will reduce the death benefit, Net Cash Surrender Value, and any policy debt. One partial acceleration may be taken. A request for additional acceleration will result in the remaining death benefit being accelerated. Terminal Illness s available through another rider the carrier has available. Terminal Illness s available through another rider the carrier has available. Must be certified by a Licensed Health Care Practitioner that life expectancy is 12 months or less in order to request benefits under the Terminal Illness Option. Pays up to the lesser of $500,000 or 75% of the policy s face amount. In California, this benefit is available through their Accelerated Living Rider, which must be elected at issue. The cost of exercising the Terminal Illness provision or Accelerated Living Rider is that the death benefit is reduced by an amount greater than the benefit payment itself to reflect the early payment of the death benefit. payments will reduce the death benefit, Return of Premium, Coverage Charge, Net Cash Surrender Value, and any policy debt. Terminal Illness s available through another rider the carrier has available. Must be certified by a Licensed Health Care Practitioner that life expectancy is 24 months or less in order to request benefits under the Terminal Illness Option. Payments are limited to 50% of a policy s total death benefit or $500,000. Terminal Illness s available through another rider the carrier has available. 9 LIFE INSURANCE WITH BENEFITACCESS RIDER: A COMPETITIVE The Access Rider is available for an extra premium. Additional underwriting requirements and limits may also apply. Obtaining benefits under the terms of the rider will reduce and may eliminate the death benefit. This rider is not long-term care (LTC) insurance and it is not intended to replace LTC. paid under the saccess Rider are intended to be treated for federal tax purposes as accelerated life insurance death benefits under IRC 101(g)(1)(b). Tax laws related to the receipt of accelerated death benefits are complex and may be taxable in certain circumstances. Receipt of benefits may affect eligibility for public assistance programs such as Medicaid. Accelerated benefits paid under the terms of the Terminal Illness portion of the rider are subject to a $150 ($100 in FL) processing fee. You should consult your tax and legal advisors prior to initiating any claim. A licensed health care practitioner must certify the chronic or terminal illness to qualify for benefits. Chronic illness claims will require recertification by a licensed health care practitioner. Other terms and conditions may apply. The rider may not cover all of the costs associated with chronic illness. The rider is a life insurance accelerated death benefit product, is generally not subject to health insurance requirements, and may not be available in all states. Prudential life insurance is issued by The Prudential Insurance Company of America, Pruco Life Insurance Company (except in NY and/or NJ) and Pruco Life Insurance Company of New Jersey (in NY and/or NJ). All are Prudential Financial companies located in Newark, NJ. Product and rider availability vary by state. All guarantees and benefits of the insurance policy are backed by the claims-paying ability of the issuing insurance company. Policy guarantees and benefits are not backed by the broker/dealer and/or insurance agency selling the policy, nor by any of their affiliates, and none of them makes any representations or guarantees regarding the claims-paying ability of the issuing insurance company. Life insurance policies contain fees and expenses, including cost of insurance, administrative fees and premium loads, surrender charges, and other charges or fees that will impact policy values. Universal life insurance policies also have additional charges and fund operating expenses. This material is designed to provide general information about the subject matter covered. It should be used with the understanding that we are not rendering legal, accounting, or tax advice. Such services should be provided by a client s own professional advisors. Accordingly, any information in this document cannot be used by any taxpayer for purposes of avoiding penalties under the Internal Revenue Code. Securities and Insurance Products: Not Insured by FDIC or Any Federal Government Agency. May Lose Value. Not a Deposit of or Guaranteed by Any Bank or Bank Affiliate. Prudential, the Prudential logo, and the Rock symbol are service marks of Prudential Financial, Inc. and its related entities. NOT FOR CONSUMER USE Prudential Financial, Inc. and its related entities.